7 Stylish Headboard Ideas For Your Bedroom! Looking for a simple way to add a bit of drama to your boring bedroom? Believe it or not… There’s a lot that can be done with the headboard! Functionally, it’s simply meant to keep your pillows in place! As per Feng Shui, it is an important element that stands for stability and protection. However, the aesthetic possibilities it offers are equally intriguing! A trendy and elegant headboard won’t only add a style statement to your bedroom, but will take its décor level sky-high! ‘Headboard’ing Your Way To A Stylish Bedroom! Implement any of these ideas, and up the style quotient of your bedroom! If wooden headboards complement your bedroom décor, then go for headboards with patterns like stria or chevron rather than opting for plain wooden headboards that are boring. Patterned headboards add personality and style to your room, and make your bed look larger. Add some artistic appeal to your bedroom with fretwork pattern headboards that are easy to notice. They look ornamental and mesmerizing and give a hotel-like setting to the whole room. To give a cute and classy touch to your bedroom, get pretty stickers headboards. Choose the right colour, design and character that matches your bed and complements the decor. And if it’s your kid’s bedroom, then let their favourite cartoon character coax them to go to bed early. A headboard with a tufted upholstery is a great option to add grace and style to your bedroom. If you don’t like to add headboards with sharp edges, but want something that flawlessly goes with your room, then you can always try curvy silhouettes. Another reason to opt for upholstered headboards is that you can always add colour to your bedroom. Choose your favourite colour, or any other bright colour, or a combination of vibrant colours to give a lively touch to your room. Whether vertical or horizontal slats, this design never fails to impress! Here the choices are immense with leather, chenille, fabric and other materials to pick from. A simple tufted headboard of either leather or fabric can give your room a stunning makeover in minutes. The soft textures and symmetric tufting make it an attractive option. And… Some DIY Bonus Ideas! 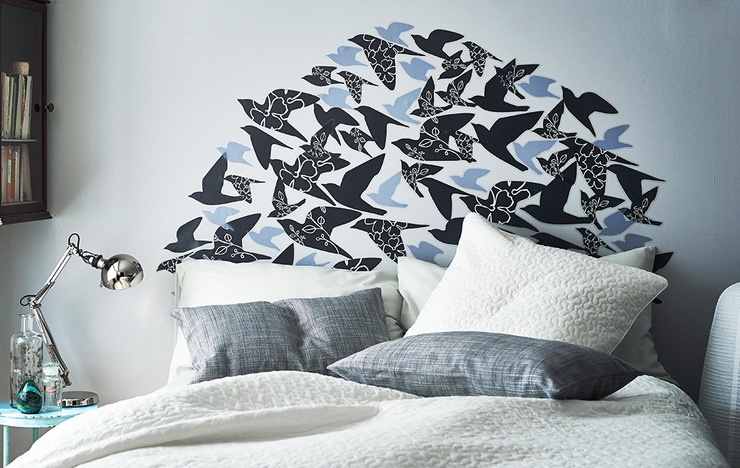 Let your creativity go wild, and bring a soft and stylish touch to your bedroom. Create a customized mosaic-effect headboard with your favourite colours. Take thick foam pieces, cut them into the shape and size of your liking, wrap with colourful fabrics, and voila! If you have a charming personality, then artwork headboards are the best ones for you. A beautiful painting can be used as a headboard for a softer effect. Or, you can always print or paint your own artwork on a large canvas and hang it on the wall! 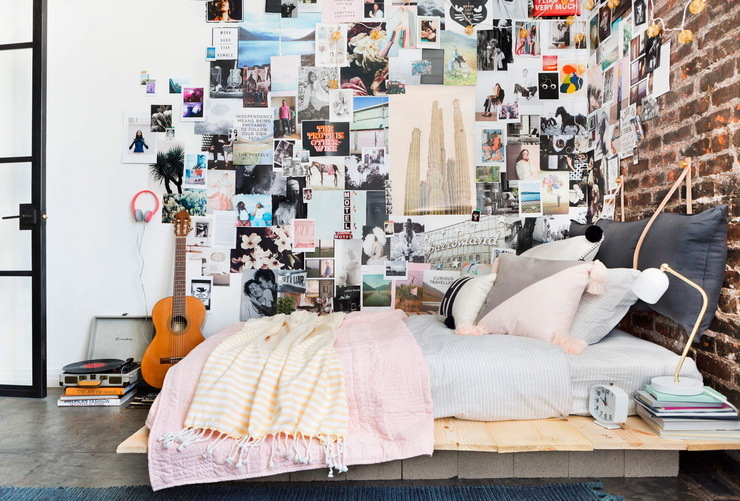 Another way to reflect your artistic personality through your bedroom is to create a collage of your favourite pieces. These pieces can be your paintings, or pictures, or any art pieces that you can make a collage of. You can also use beautiful cardboard boxes and paint in vibrant colours. As you hang the collage of art pieces, add dimension to your headboard while painting the sides of each piece in a contrasting colour. Take pillows off your bed and place them on the wall! Yes! Go for this creative headboard if you are the one who can’t sleep without pillows. Want your bedroom to be the stuff of dreams? Get in touch with Hipcouch today! Older PostKeeping It Cool: Tips For Designing A Home That Beats The Heat!